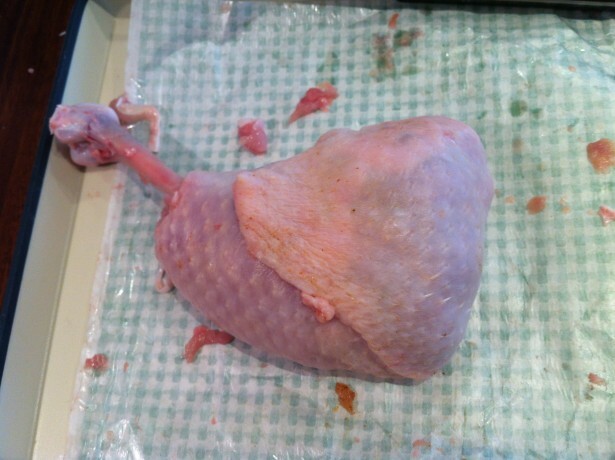 My inspiration for this French Boned Chicken is two fold. I have eaten a slow cooked rabbit dish which looked exactly the same, when I ate it, I couldn’t really recognise what part of the rabbit it was. I’ve now found out. The second was from a new programme on the BBC called Chefs on Trial. It is all about the hiring process of new head chefs. In each episode, one of the hoops they have to jump through is to create a dish suitable for the establishments menu. During this test it is revealed how much each dish should cost and a lot about portion control. A main course dish is costed at £5-£7. I love creating really good food from inexpensive ingredients, I think it really showcases someones talents and imagination. Hence the dish above is costed at about £3/head. 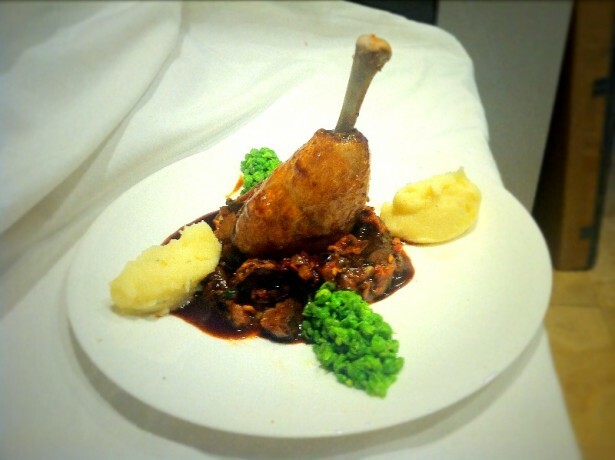 What is a French Boned Chicken leg. Well it’s not too far from any French trimmed meat. Essentially a clean bone sticking out. It isn’t simply a sticky out bone though as I will demonstrate. Trim around the bone and twist off the flesh. Pull out all of the white tendons. I did this with some pliers. Trim around the thigh bone and take out. Continue trimming around all the white pieces and remove the cartilage and thin drumstick bone. 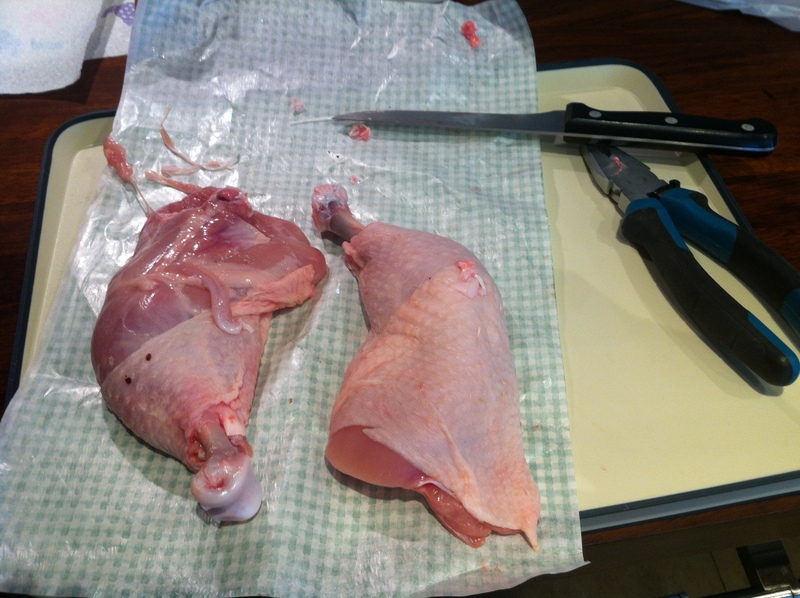 Take the thigh meat off and mince with a knife. 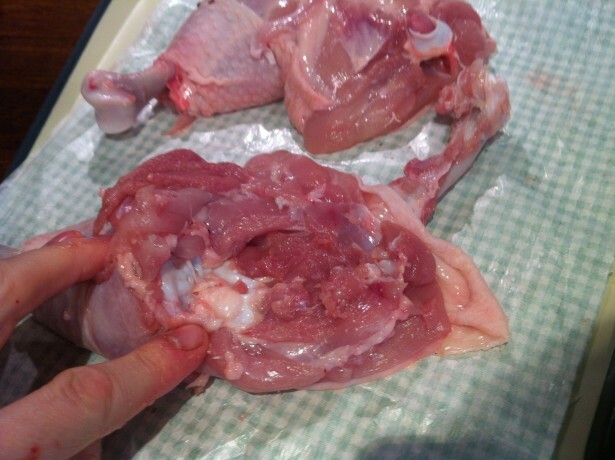 Trim around the drumstick bone so that it is free. Push up to create a hole. 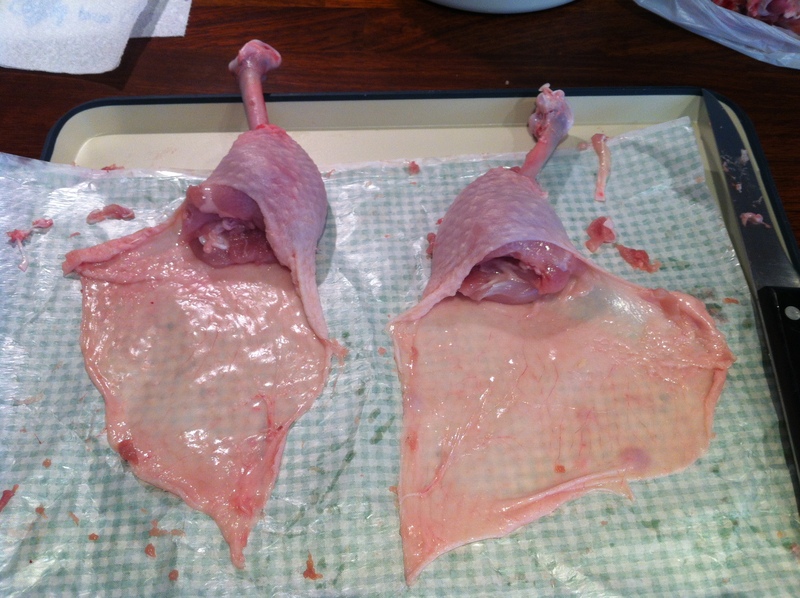 Put the minced thigh meat back, and wrap up with the skin. 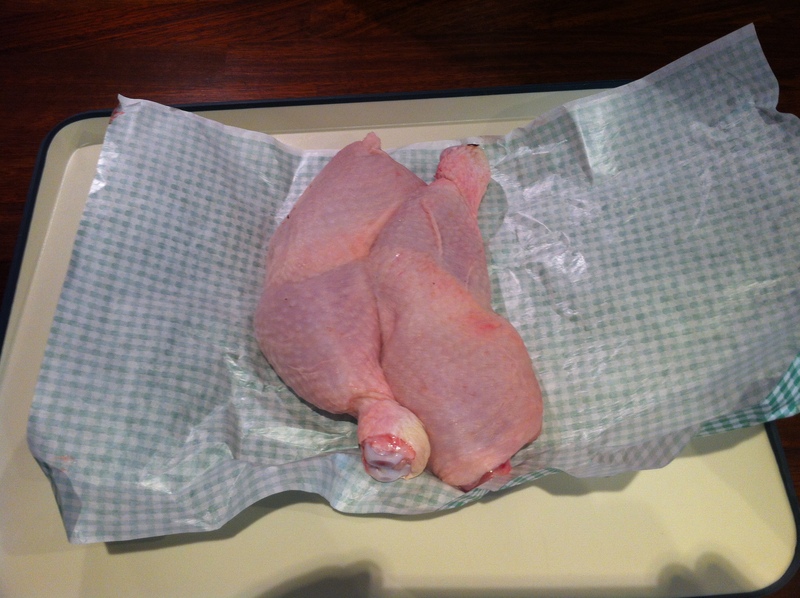 Wrap in cling film and steam for 20-25 minutes. They can then be put left in the fridge. I served this some Imam Bayildi. Again this benefits from being made a day ahead. To reheat them for dinner. You can either deep fry them for 2 minutes to crisp the skin or bake in a hot oven for 10 minutes. To finish them off, place in a hot pan with spoonfuls of the beef stock, let this evaporate until really sticky. The steam will finish off the chicken and leave you with a wonderful shiny glaze. I served this with some of the peas crushed, mash and the aubergine stew. 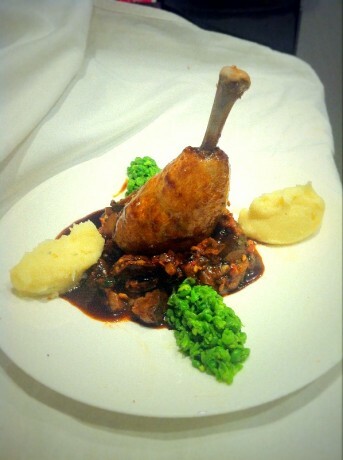 The chicken leg is boned beautifully! I havent had much occasion to French bone chicken but they do look so beautifuk when done correctly. That’s a lovely plate of food too! Thanks Nazneen. You’ve been quiet lately. I’m currently in Vegas, as close to Denver as I’ll ever get. Shame there’s no foodie conference on. Dave, I so appreciate the step-by-step for the French bone chicken! Great illustration and what a beautiful dish done inexpensively! Hi Suzy, I’ve begun to learn that a picture is worth a thousand words. I should do it more often. What an elegant presentation! I’ve never Frenched chicken legs before, only lamb and I love that you minced the thigh and wrapped it back onto the leg with the skin. We were in Vegas a few years ago, you should try Aureole Restaurant with its vertical wine cellar. And if you get bored (there is only so much of the noise that we can take), rent a car out to Red Rock for a hike, it’s breathtaking! Hi Eva, I think I’ve heard of the Aureole restaurant. Unfortunately a 24hr layover isn’t enough time to do anything. Hopefully I’ll get a bit more time later in the year. Hi Sneha, thanks for stopping by and leaving a message. Practice makes perfect as they say, Maureen. Dave you did a beautiful job deboning this leg. I think if I tried this I might have dismembered my own finger, just kidding. Love your sauces and sides. Just gorgeous, I am on my way over for dinner!!! Sharing, of course! Thanks Bam, don’t you love technology. It’ll be down to a update no doubt. We call this a leg quarter in the states as it includes the thigh. I was going to attempt it tonight (as I recently saw a classically trained chef do it on a cooking competition show) but I only have the drum (which is what he used). I need to get leg quarters to do it as you have done. So curious about the whole leg with minced thigh meat. Nicely done. Thanks for sharing. Thanks Erin, probably me just being greedy and wanting a bigger portion.